Is there a better alternative to FontCatalog? 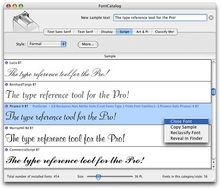 Is FontCatalog really the best app in Font Tools category? Will FontCatalog work good on macOS 10.13.4? FontCatalog shows your fonts organized by category and style. Find a font by design, rather than by name! Visualize text in hundreds of fonts simultaneously. 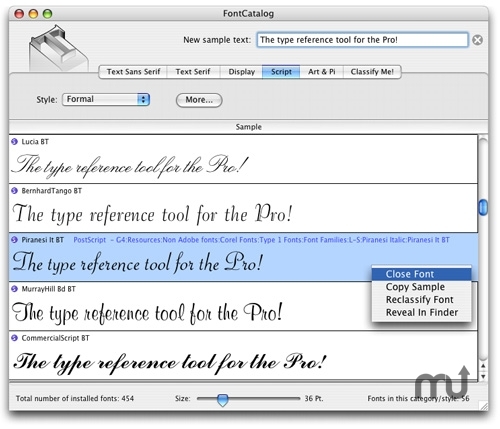 FontCatalog searches your hard drive for similar fonts... and activates them for you. FontCatalog needs a rating. Be the first to rate this app and get the discussion started! Scroll samples with arrow keys, page up/down, home, end. Change sort order instantly. Click on Sample bar to order by width or by name. Progress bar is more accurate when loading fonts.